Cleveland, OH (January 7, 2014) – The retail automotive industry in Northern Ohio sold 229,534 vehicles in 2013, a jump of 10.3 percent over 2012, according to figures released today by the Greater Cleveland Automobile Dealers Association (GCADA). For the month of December 2013, sales of new cars and light trucks were up over 12 percent when comparing the month with December of 2012. 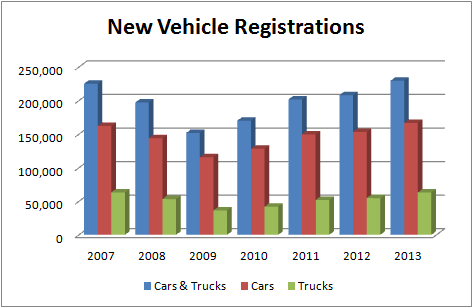 Franchised new vehicle dealers in Northern Ohio sold 16,648 vehicles in December of 2013 versus 14,682 the same month a year prior. The month capped off 12 straight months of sales growth in 2013 despite some inclement weather between Christmas and New Years, a week that typically drives sales for the entire month. The final unit sales tally for the year also bested industry sales forecasts by more than 300 vehicles. A total of 25 brands registered sales increases in December of 2013 versus December of 2012. For the year, 24 brands posted sales increases in 2013 over 2012. Ford was Northern Ohio’s best-selling brand with 40,960 vehicles sold in 2013 versus 36,319 sold in 2012, an increase of 12.78 percent. Chevrolet came in second, but enjoyed a sales increase of 15.75 percent when comparing 2013 with a year prior. Chevrolet sold 32,679 vehicles in 2013. Honda and Toyota finished in a virtual dead heat in terms of sales volume for 2013, with the former edging out its offshore rival by less than 300 vehicles in terms of unit sales volume for the year. Honda sold 19,997 vehicles in 2013 compared to Toyota, which sold 19,698. The following brands posted sales increases in December of 2013 versus December of 2012: Acura, BMW, Cadillac, Chevrolet, Dodge, Fiat, Ford, GMC, Honda, Hyundai, Infiniti, Jaguar, Jeep, Land Rover, Lexus, Lincoln, Mazda, Mercedes-Benz, Mitsubishi, Nissan, Porsche, Smart, Subaru, Toyota and Volvo. The following brands posted sales increases for the year: Acura, Audi, BMW, Buick, Cadillac, Chevrolet, Dodge, Ford, GMC, Honda, Hyundai, Infiniti, Jaguar, Land Rover, Lexus, Mazda, Mercedes-Benz, Mitsubishi, Nissan, Porsche, Subaru, Toyota, Volkswagen and Volvo.